From Christie's June 1990 Auction. 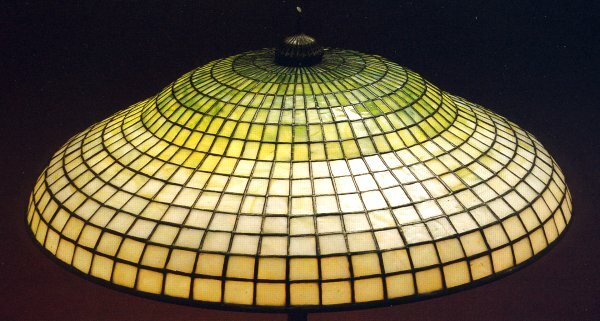 The broad double domed shade in green and yellow mottled glass, graduating to white-yellow glass at the edge, supported by a ribbed, cushioned bronze base, the shade stamped TIFFANY STUDIOS NEW YORK, the base stamped TIFFANY STUDIOS NEW YORK 370. 23 1/4" high, 20" diameter of the shade.